Safe and multifunctional, BioPlus® removes odors biologically, cleans all surfaces and replaces all other disinfectants and chemicals - saving you water, labor and costs. 100% green, biological based. • Low VOC certified. Effectively seeks out organic wastes. Inhibits growth of pathogenic bacteria. Clears and maintains draining pipes. Eliminates sources of most offensive odors. Safe, non-toxic to humans and animals, biodegradable, non-acidic, non-caustic and guaranteed non-pathogenic strains. Dramatically reduces BOD, COD, TSS and CO2. BioPlus® is a multipurpose, more effective and sustainable alternative to conventional disinfecting chemical cleaning solutions. BioPlus® is UL ECOLOGO® and CACC certified for reducing environmental impact. Keep urinal bowl clean, clog-free and pleasant-to-use. BioPlus® eliminates urinal odors, lime scale & uric scales stains and protects cleaned surfaces against new contaminants. All waterless urinals should be cleaned thoroughly everyday as with other urinals. Apply BioPlus® at least once to twice daily for cleaning on urinal with brush and rinse, or spray directly into urinal surface. FOR REFILLING: Dilute 1 part BioPlus® Concentrate up to 20 parts with water (25ml sachet to 500ml with water) in a sprayer bottle. 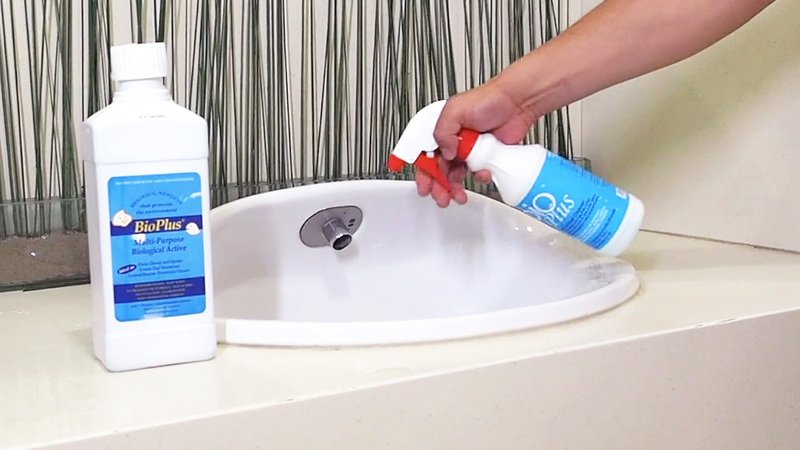 OTHER USES: For cleaning toilet bowl surfaces, floors (grout, crevices, corners), basins, mirror, window, walls, refuse bins and all fixtures in washrooms including drain pipe maintenance. Standard Packing: 12 x 500ml per carton.